The MCX8000 offers total command of both Serato DJ Pro and Denon DJ Engine technology, putting all of your favorite features at your fingertips, both with or without a computer. The MCX8000 also now offers support with the powerful Engine Prime librarian software so you can optimize and export your library in an MCX8000-friendly format. In this article, we answer some popular questions about the features and functionality of the Denon DJ MCX8000. Is the Denon DJ MCX8000 a standalone controller? What are the system requirements for the Denon DJ MCX8000? What type of audio interface does the Denon DJ MCX8000 feature? What audio inputs and outputs are included on the Denon DJ MCX8000? Does the Denon DJ MCX8000 mic inputs feature effects like Echo, Talk Over and Post? Does the Denon DJ MCX8000 support a mini Innofader crossfader? Is the crossfader on the Denon DJ MCX8000 user replaceable? What are the built-in effects for the MCX8000 used for? Can two DJs quickly switch off back and forth when using the Denon DJ MCX8000? What is the size of the platters on the Denon DJ MCX8000? How do you scroll through a track by using the touch strip on the Denon DJ MCX8000? What is "Disable Slip on Load"? Is the Denon DJ MCX8000 supported with Virtual DJ, Traktor or any other DJ program? 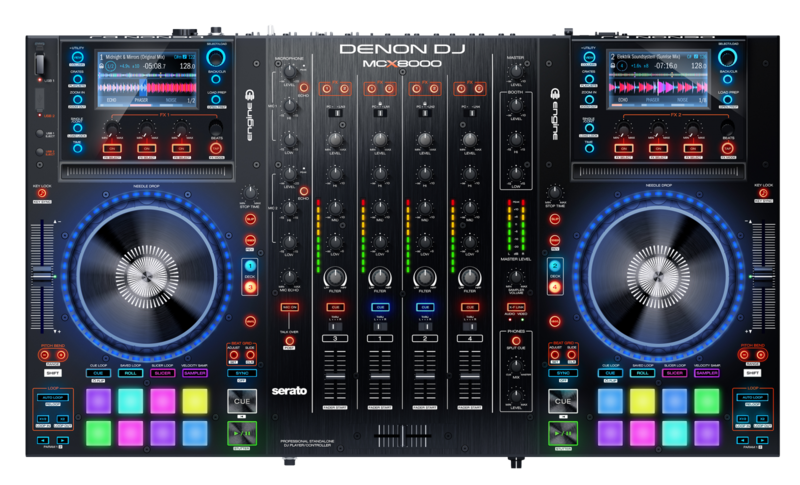 Which DJ software comes with the Denon DJ MCX8000? Will samples load automatically when I press the Sampler button? Are the pads on the Denon DJ MCX8000 velocity sensitive? How many mic inputs are there on the Denon DJ MCX8000? What do I do if my microphone is too loud? What is the Denon DJ MCX8000 outer housing made out of? Does the Filter effect work with every source on the Denon DJ MCX8000? What type of USB storage devices does the Denon DJ MCX8000 support? What's the maximum size to use for a USB storage device on the Denon DJ MCX8000? Can I record my Mix directly to my USB flash drive or hard drive? Where can I learn more about the Denon DJ MCX8000? What's the weight and size dimensions for the Denon DJ MCX8000? The platters on my MCX8000 aren’t very responsive when scratching, how can I improve this? I can adjust the stop time with the Stop Time knob on the MCX8000, but how do I adjust the start time? Does the MCX8000 have a "Vegas" mode? What size are the display screens on the Denon DJ MCX8000? Are the display screens for the Denon DJ MCX8000 high definition? When viewing your song list, how can you filter your songs when using Engine? Can you change the display settings of the Denon DJ MCX8000? If I adjust the speed of the Zoom Main Waveform Display in Serato DJ, will that be displayed on my Denon DJ MCX8000 screens too? How do you DJ with a closed laptop and only use the Denon DJ MCX8000 screens? Why do my display screens look foggy or blurry? How many channels on the Denon DJ MCX8000 can you use with Engine? Will the track information, ID3 tags and saved Hot Cue's from Serato DJ import into the Engine software and Engine on the Denon DJ MCX8000? Can you use Serato DJ and Engine at the same time on the Denon DJ MCX8000? Should I analyze all my songs in the Engine software prior to using Engine on the Denon DJ MCX8000? Why is that when I'm in Engine mode on my Denon DJ MCX8000, some of the buttons are not illuminated? Is the USB hub in the rear of the Denon DJ MCX8000 used for Engine? From the Denon DJ MCX8000, how do I know if I'm in Engine or Serato DJ mode? How do I adjust the Engine settings from the Denon DJ MCX8000 display screens? Can you set a Beat Grid or utilize the Sync feature in Engine? What are the supported music file types that can be played in Engine? Does Engine support an iTunes library? While using Engine, can you record your sets directly to a thumb drive without using a computer? Is DVS supported with the Denon DJ MCX8000? Does the Denon DJ MCX8000 unlock Serato DJ? Why is it that when I'm in Serato DJ mode, some of the buttons on the MCX8000 are not illuminated? Yes! Along with full control of Serato DJ Pro, the MCX8000 doubles as a premier standalone player and mixer utilizing Denon DJ's powerful onboard Engine software. Two hi-definition display screens control Denon DJ’s revolutionary standalone Engine software and Serato DJ Pro operation. The controller also includes 2 USB inputs for Engine playback in standalone mode. The Denon DJ MCX8000 features a built-in professional 24-bit / 44.1 kHz resolution USB 2.0 audio interface. You can use the Echo effect to adjust the amount of the reverb effect on the microphones’ audio signal. You can use the Post effect to reduce the volume level of the master mix when you speak into the microphone. Note: Press and hold Shift and then press the Post button to activate/deactivate the Post feature. When you're on the ON position, the microphone's signal will not be sent to the Booth Outputs. Yes! The Denon DJ MCX8000 can be used with the mini Innofader PNP P.
Yes. If needed, you can contact Denon DJ support to assist you with a replacement crossfader. You can also reach the Parts department directly by visiting DenonDJ.com/support. Once there, under InquiryType, select PartsInquiry and fill out the form. The Denon DJ MCX8000 4-channel digital mixer comes with 3 built-in instant effects for the Engine software and Line inputs. The three built-in effects are limited to Echo, Phaser, and Noise. Yes! You can have instant DJ hand-offs when using two USB drives. Also, one DJ could use the laptop and another DJ can use Engine for instantaneous hand-offs. The Denon DJ MCX8000 has dual 5 1/2" hyper-responsive platters. The capacitive, touch-sensitive platter controls the audio playhead when the wheel is touched and moved. This setting will disengage the Slip Mode upon loading a new track. This way you won't forget if Slip Mode was still enabled for your old track and accidentally apply or perform an effect incorrectly to your new track. Remember, that Slip Mode allows the currently playing track to continue playing beneath any scratching, looping, cues, etc. The Denon DJ MCX8000 has been developed from the ground up as an amazing controller for Serato DJ or Engine. Denon DJ and Serato have carefully tuned and mapped each control to create the best possible out-of-the-box user experience with the included Serato DJ software. However, since MCX8000's hardware controls appear to your computer as a generic MIDI device, it can indeed be custom-mapped to any other DJ application that supports user or developer-created custom mapping. A note about the MCX8000's onboard screens: They were designed expressly for use with Serato DJ or Engine. In most situations, only the MCX800's onboard knobs and sliders will work with other software applications that can be mapped to the MCX8000. Denon DJ Engine Prime and Serato DJ are included for free with your Denon DJ MCX8000 purchase. Samples will need to be loaded into SP-6 manually, but once this is done Serato will automatically save and re-load them upon exiting and re-opening the software. The Denon DJ MCX8000 has 16 velocity-sensitive trigger pads with backlit RGB feedback. It includes 10 pad modes for hot cues, loop slicing, and sample triggering and rolls. The Denon DJ MCX8000 features 2 balanced ((1) XLR, (1) 1/4") microphone inputs. Starting with firmware v2.0, the microphone level can now be attenuated by up to -20dB. Both microphone levels can be adjusted by navigating to the Utility menu and adjusting the mic attenuation level under Mic Settings. The Denon DJ MCX8000 is made out of a solid rugged metal chassis. The Filter effect will work on any source and onboard effect with Engine. The maximum USB thumb drive or external hard drive is 2 TB. You will not be able to record directly to a flash drive or hard drive attached to the MCX8000 USB hub, but Serato does offer an option to record your mix with their software. See this tutorial for more a complete walkthrough. Starting with firmware v2.0, you can now adjust the USB Record Level from the Utility menu. If your mixes are recording too loud or soft. use this to find an optimal signal level for your mix. The MCX8000 has a setting that allows you to configure the platter sensitivity to your liking. To adjust the platter sensitivity on the MCX8000, open the Utility Menu by holding the VIEW button for 2 seconds. Once the Utility Menu opens, use the SELECT knob to scroll to the setting titled “Platter Sensitivity.” Here you can adjust the sensitivity of both Left and Right platters to your liking. The greater the number the more responsive the platter will act when scratching. The MCX8000 does not have a dedicated knob for Start time adjustment, but this can still be set manually in the Serato preferences. Just click on Setup at the top and you will see the Start and Stop time settings under the DJ Preferences tab. For more information regarding the Denon DJ MCX8000, please visit the product page. The Denon DJ MCX8000 features dual 4.3-inch hi-definition display screens to control Denon DJ’s revolutionary standalone Engine software and Serato DJ. Yes! With this release, Denon DJ propels the DJ into the next generation of high-performance standalone technology (Engine) with dual high-definition screens, while simultaneously running Serato DJ. You can filter through songs from the MCX8000 screens in Engine by artist, song title, genre, BPM, and key. Starting with firmware v2.0, your library can also be sorted by BPM so you can view your songs in order of their BPM. The Display screens have a Utility button that allows you to change your display settings. Press this button to switch between the library view and track view. Press and hold this button to open the Utility menu. See the User Guide for more information. Press and hold SHIFT, and then press this button to change the column type in the library view. Yes! If you adjust the Zoom Main Waveform Display in Serato DJ by pressing either the + or – keys on your keyboard, you will see the adjustments being made on your screens. One of the most useful features of the Denon DJ MCX8000 is utilizing its display screens. These screens allow you to DJ stand alone or without having your laptop open, which can sometimes disconnect you from your crowd. In this guide here, we will show you how to set up your Mac or Windows laptop so you can close the lid, push the computer to the side, and focus on the dance floor. For shipping and handling, each screen has an electrostatic protective sheet on them which prevents scratches. Please remove this sheet for a nice clear display. Engine is the exclusive revolutionary DJ software under the hood of the MCX8000 that enables you to perform without a laptop. This amazing software gives you the ability to perform with just your MCX8000 and a USB thumb drive. The accompanying Engine and Engine Prime librarian software for PC/Mac are used to arrange, optimize, and export your library to a database on a USB drive for use with Engine on your MCX8000. You can use 2 channels of Engine on decks 1 & 2 on the MCX8000. Will the track information, ID3 tags and saved Hot Cue's from Serato DJ import into the Engine Prime software and Engine on the Denon DJ MCX8000? Yes! We recommend first importing your Serato DJ crate into the Engine Prime software on your computer and arranging your library there before exporting to a thumb drive for use on the MCX8000. This will guarantee that all your files play well in Engine so your set can run smoothly. Important: For proper analyzation of your tracks in Engine, you need to make sure that the Serato DJ crate gets fully analyzed in the Engine software on your computer first. Yes! You can use Engine and Serato at the same and mix between standalone or two different computers with two different DJ’s. Engine Prime is a new iteration of the revolutionary Engine DJ software. This is a music analysis and management software for optimizing your music library, file navigation, and playback experience on the Denon DJ SC5000 prime media players and the MCX8000. Engine Prime was built from the ground up to improve on the success of its predecessor while adding tons of new features such as personalized user profiles that store preferences like screen brightness, sync settings, pictures or logos for the center display, and much more. Yes. It's important to analyze all of your songs or Serato DJ crates in the Engine Prime software prior to DJing with them. This method will ensure that all of your songs are properly read and played accurately. Not all buttons on the MCX8000 will have a purpose when in use with Engine in standalone mode. If a button is not illuminated while using Engine, this button is not supported in that mode. No. The USB hub will not send information to Engine. It bypasses the controller and sends information to and from your computer (with the MCX8000 also connected), and can be used in the same manner as a powered USB hub. From the Denon DJ MCX8000, how do I know if I'm in the Engine or Serato DJ mode? There will be an Engine logo displayed in the upper left-hand corner of the screens to indicate if you’re in Engine mode. Can you set a BeatGrid or utilize the Sync feature in Engine? Yes, both Beat Sync and Beat Grid have been added to the MCX8000 as of the v2.0 firmware update. Once a song has been loaded to a deck, hold the Slide button and rotate the platter on the corresponding deck to set the beat grid. Engine (a track on a connected USB flash drive; Decks 1 and 2 only). Note that the Line/Phono selector switches on the rear panel must also be set properly. Also, a channel’s controls will only send MIDI information when its Input Selector is set to PC. Does Engine support my iTunes library? Yes! Engine Prime supports iTunes 10, 11 and 12. The Engine desktop software allows you to view your iTunes library and playlists internally, without even having to open the iTunes application. Use the Library tab in the Engine Prime Settings to toggle the Serato and iTunes libraries on and off. While using Engine, can you record your sets directly to a thumb drive without having to use a computer? No. At this time Engine cannot be used to record your sets. For more popular questions about the Engine Prime software, visit our Engine Prime FAQ guide. Does the Denon DJ MCX8000 unlock Serato DJ Pro? Yes! Simply download Serato DJ Pro and connect the MCX8000 to your computer. Not all buttons on the MCX8000 will have a purpose when in use with Serato DJ Pro. If a button is not illuminated while using Serato, that button is not supported in that mode. There will be no logo displayed in the upper left-hand corner of the MCX8000 screens if you’re in Serato DJ mode. There will be an Engine logo displayed in the upper left-hand corner of the screens if you’re in Engine mode. It does! With the MCX8000 powered OFF, power the controller ON while holding down the VINYL button.